State-of-the-art construction is developed with consulting European style. Prolonged lifetime more than 2 million shots of injection cycle . Mould impression and Core insert are manufactured from steel brought from ASSAB or Germany(DIN 1.2316) featuring excellent polish feature, superior hardness( HRC46-HRC53) and anti-rust to acquire substantial accuracy and fantastic quality. Unique developed water hoses reduce leaking and cooling water-spots on preform. Global criterion screw neck, brought in nitriding steel with superior hardness and durable time. Patent developed correcting technique is implemented to reduce the potential preform thickness disorder occurring in the course of manufacturing. The pneumatically-driven nozzle pin(Japan Origin) for synchronized high-rate up and down motions. Worldwide state-of-the-art bi-axls fixed alignment and self-locked arrangement was put into practice on our PET preform mould. we are a devoted PET mould,preform mould,PET bottle mould manufacturer and maker in huangyan,China.Each set of PET preform mould undergoes strict mould trials and preform mould trial video will be sent to customer for confirmation before shipping from factory and attaches full set of parameter that is recorded depending on their own and sole serial number. Together with the PET preform mould, full set of spare parts will be supplied for free to keep mold normal operation . 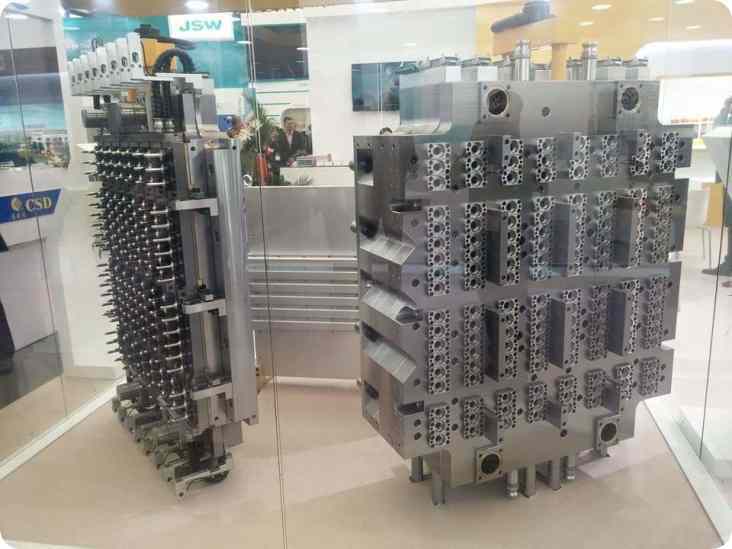 In the use of the PET preform mold, Topworks provides adequate spare part to any request and Topworks service department are very willing to provide technical support immediately for any possible request in any time,also we could send our engineers overseas for mold installing and adjusting. PET, also called poly ethylene terephthalate, is also known as polyester. At present, the most used kind is PET-GF; it is mainly for bottle PET preform manufacturing. The rheological property of PET is better in molten state, and the pressure effect on the viscosity is greater than that of temperature. Therefore, it is mainly to change the fluidity of the melt by changing the pressure. plastic processing .due to pet macromolecules containing grease, it is hydrophilic. Pellets in high temperature water are more sensitive, the much moisture will decrease the molecular weight of pet, which would lead to poor color and brittle parts. Before processing, the material must be dry; the drying temperature is 150 degrees, time more than 4 hours. And generally it is 170 degrees, about 3-4 hours. Whether the material is completely dry can be tested by shot to air. Recycled material ratio is generally not more than 25%, and also the reground material should be completely dry. injection moulding machine .due to the shorter stable time after melting and high melting point, it is necessary to use the injection machine with more multi-step temperature control and less plasticizing friction heat system .and all weight(products and runner) is not less than 2 / 3 of machine injection volume . PET preform mould and its gate design. Generally, PET bottle preform mould is installed with hot runner system. There should have insulation plates (about 12 mm thickness) between the PET preform mould and injection moulding machine, and the heat insulation plate can withstand high pressure. Air venting must be sufficient to avoid local overheating or fragmentation, but the depth of the slot is generally not more than 0.03 mm, otherwise it is easy to invite flash. melt temperature .it is 270-295 degrees Celsius by shot to air, PET-GF can be set to 290-315.
injection speed. The fast shot can prevent premature injection solidification. But too fast will lead to high shear rate and the brittle products. Shot is usually completed within 4 seconds. back pressure. The possible low back pressure is a better way to avoid wear. Generally the back pressure is not more than 100 bar. stay time and temperature. Stay time shouldn’t be long to prevent the decline of molecular weight, and the temperature should avoid more than 300 degrees Celsius possibly. If the down time is less than 15 minutes, shot to air is OK; but if over 15 minutes, it should use PE to clean barrel, and the barrel temperature decrease to PE temperature. Note: recycled materials cannot be added much, otherwise it easy to produce poor quality products. If the mould temperature or material temperature is not proper, it is easy to produce “opaque” pet preform. The low mould temperature and the fast cooling rate would achieve transparent PET preform. lower the temperature,especially on the bend section.